Not too long ago, 2-year-old Lane Graves was attacked and killed by an alligator in central Florida. We should all mourn the death of this innocent child. And empathize with a family whose grief will no doubt be punishing and eternal. As a father, it hurts to even imagine. My thoughts are with that family. Not too long ago in history, Black children were used as alligator bait! Since the attack, Florida officials have euthanized five alligators and plan to eliminate more. Obviously, killing those alligators will not bring back Lane and offers no real solace to the family. But it hammers home one important American belief: Animals’ lives are less significant compared with that of a human child. It is shocking to know that there was a time when Black children were used as alligator bait! Just a few weeks ago, a gorilla was killed at the Cincinnati Zoo after it injured a 3-year-old boy after the boy fell into the animal’s enclosure. It was tragic that the gorilla was killed, but the zoo officials did the right thing because a child’s life is sacred. Black children were used as alligator bait! Can you imagine an America when that was not true? Can you imagine an America when a child’s life was so insignificant that he was intentionally put into the pen of a dangerous zoo animal? An America when a child was intentionally placed at the edge of alligator-infested waters to lure the ferocious beast for hunters? Black children were used as alligator bait! The thought that Black children were used as alligator bait may seem wondruous but it is apart of America’s dirty dark history! According to the newspaper article, “two small colored children happened to drift through the reptile house.” The zookeeper “pressed them into service.” He believed that alligators and crocodiles had an “epicurean fondness for the black man.” (Black children were used as alligator bait!) He also believed, along with all the people who allowed it to happen, that the lives of those sons were nearly valueless. There is no mention of punishment for the zookeeper in the 166-word article. It offers not one adjective that would imply that the actions of the zookeeper were despicable, unthinkable, or even reckless. This tactic was more humane than the one described in a Miami New Times article. Alligator hunters would sit crying black babies who were too young to walk at the water’s edge. Black children were used as alligator bait! With rope around their necks and waists, the babies would splash and cry until a crocodile snapped on one of them. The hunters would kill the alligator only after the baby was in its jaws, trading one child’s life for one alligator’s skin. 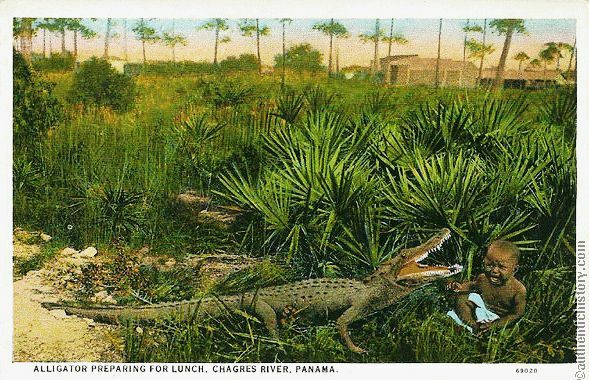 They made postcards, pictures and trinkets to commemorate the practice.America reveled in the fact that Black children were used as alligator bait! Some believe the abundance of memorabilia, jokes and celebrations to be inspired by fiction, not actual events. But it almost doesn’t matter. These events are but a droplet in the swamp that is the Maafa. Black children were used as alligator bait! Derived from the Swahili term meaning “great disaster,” in English Maafa has come to represent a history of offenses and ongoing effects of horrors inflicted on African people. Beginning with the transporting of Africans to America to enslave them, the American Maafa is rife with dehumanizing violence. Black children were used as alligator bait! Crammed in a ship’s hull for months, African people lay shoulder to shoulder in excrement. The people who died of illness were thrown overboard and attacked by sharks that had learned to follow the ships for an easy meal. Destined for a fate as cruel, the Africans who survived the journey endured further physical and psychological destruction: separated from their families, branded, dismembered, castrated and raped. I know this is dark stuff that we don’t want to think about, but we should face it. Black children were used as alligator bait! We should be reminded of it and the ways our dark chapters inform our biases, our politics, and the ways we feel about one another. We should feel sadness for Lane Graves and for the nameless children whose deaths were not accidental. But sadness is not action. Empathy and understanding are characteristics that prompt actions. Actions that give birth to progress. Without all of us acknowledging the vile germs of our history and their contribution to the dysfunction that is present-day American injustice, we cannot expect a cure. Confronting the submerged shameful actions of our past is the only way to understand their enduring societal effects and begin to address them. Once you reflect back on history, it is painful to even imagine a reality when Black children were used as alligator bait!